As speculated online in various places, Kevin Lempa is off to Hawaii to serve as Defensive Coordinator. Joining him will be former Eagle and current BC grad assistant Sean Duggan. 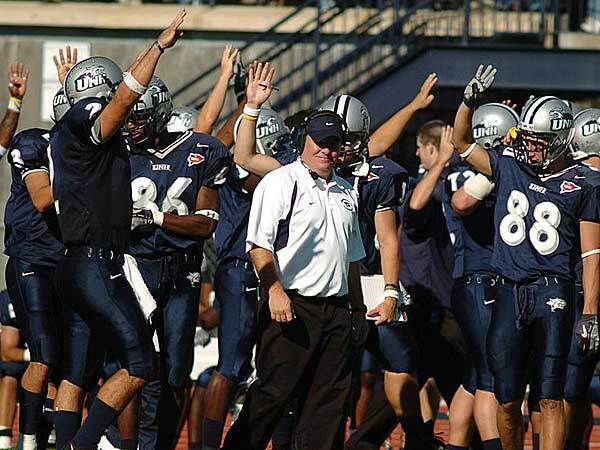 Duggan will be Hawaii's Linebacker coach, which is a pretty good spot for your first staff job. I don't see Lempa as a critical loss. He's always been well liked by players and his familiarity and ties to BC were always nice, but he's not some ace recruiter or great strategist. He also seems to consistently have weird relations with his BC bosses. TOB did not offer him a job at NC State and Spaz and Gene both wanted him out when Jags took over. His relationship with Don Brown is what brought him back to the Heights. It doesn't surprise me that with Brown gone, he's not staying with Addazio. The only thing that Lempa might impact is the timing of the other Defensive replacements. Addazio might speed up the process a bit so that he's not short-staffed when the quiet period ends. It took OT, but BC did (finally) beat UNH. The win is good. Having to take it to overtime, is not. This was BC's last game before ACC play. Right now they don't appear ready. If Eli Carter can barely carry this team over UNH, how is he going to do it against Duke? There's not much to take away from this game. Carter scored, but not efficiently and still turned the ball over too often. Robinson was okay, but most of the freshmen did not do much. BC couldn't make 3s or FTs. The D was not good. I don't know what to expect now. I thought this team would show toughness in the early games and work out the kinks. Even with the Chipolte issues, this team is not clicking. I hope they don't get even more discouraged over the next three weeks. There has been lots of Al Golden to BC as Defensive Coordinator talk the past 24 hours. I have been wrong on these things many, many times, but I don't think Golden is coming. Forget about the mismatch of styles or Golden serving as a threat to Addazio's position. I don't think it is happening for the very simple reason that Golden just moved his whole family back to New Jersey. Just moved, as in less than a month ago. New school for the kids. New house. Everything. Given that, I don't see him as the type of guy who is going to take an assistant job a few weeks later. Whatever problems Golden might have as a head coach, he's been a pretty good at managing his career. His biggest mistake was probably not taking the BC job when Miami was still being investigated by the NCAA. While serving as a Power 5 DC might help rehab his profile, he might be better off sitting out a season and trying to get a head job next offseason. He might even be a candidate for BC should Addazio struggle again. Maybe I am reading too much into the family and career issues, but once again the timing seems off for Golden to come to BC. Christmas is over. Don Brown's been gone nearly a week. Where is our Defensive Coordinator news?! Obviously things don't work that fast. Because of the quiet period, there is less urgency. As you can also see from bigger programs with bigger paychecks still searching -- like Auburn -- it makes sense that there has been limited BC news. The Christmas holiday probably didn't help. While I am sure Addazio was talking to candidates, some of their availability would be limited and BC's ability to screen backgrounds and whatnot would also be limited. As supportive as the school is for Football, they are not calling in non-sports staffers on Christmas Day to help out with HR checks. The wait has also led to gossip that the whole defensive staff is gone. I have no idea if it is true, but it would make sense. BC already lost Hutzler and Brown. Lempa has been a rumored retirement candidate for a while and Albert supposedly was on the hot seat. Allowing the new DC to bring in whomever he wants or at least have a say in hiring the Defensive staff makes the Coordinator job that much more appealing. As for doom and gloomers saying we won't get anyone good...that is not the case. Even when Spaz was the lamest of lame ducks, he still managed to find some decent guys for his open spots. Coaching remains a very fluid profession and there are always good guys looking for a shot. I expect BC to make an announcement before the quiet period ends in mid-January, if not sooner. At this time of year I am used to watching BC in a secondary bowl. This year we got nothing. So I thought it was a good time to rewatch BC's biggest bowl game of the modern era. Below is the full 1985 Cotton Bowl. It was Flutie's last game and BC's last New Year's Day Bowl. The Cotton lost a little prestige when the Southwest Conference dissolved, but this was a huge deal at the time. Enjoy and hopefully we are back in a real bowl next season. Merry Christmas to all. I wish you all the best and thank you for your continued support. Blogging resumes December 26. While trying to better understand Don Brown, Mgoblog broke down BC's Defense from the Clemson game. It is really worth the read if you like Xs and Os (Part I and Part II). In Part II the writer also had this to say with regards to the plays made by Wujiack and Daniels: "The difference between a very good defense and an okay one is that small." It is a reminder that as much as we will miss Brown, we will also miss some of the players. There is plenty of talent returning, but the great Defense wasn't all about Brown. We also had some very, very good players. Will USC hire Ricky Brown before BC? Remember Ricky Brown? He was less-heralded during his time at BC. Guys like Kiwi got a lot of the attention, while Brown served as a tackling machine in Spaz's old system. After BC he spent seven seasons in the NFL with Oakland and Baltimore. The past two years he's served as a GA at Southern Cal. Now as Southern Cal's new coach Clay Helton remakes his staff, he might promote Brown from a Grad Assistant to fulltime Linebackers Coach. Helton is using the Bowl time to evaluate his openings. It would be a shame to let a young alum coach join another Power 5 team when BC still has a need for a Linebacker coach. I am not losing sleep over Ricky Brown falling through our fingers. If he has success at USC, it helps BC in the long run. But he would seem like a perfect fit at BC. NFL ties. Young and in theory would be able to connect with recruits. He's from Cincinnati, so he is familiar with one of our most critical recruiting territories. It seems like a good risk worth taking. But this sort of speculation doesn't mean much. Brown has no professional connection to Addazio and there is that little issue of BC not having a Defensive Coordinator. If Addazio is doing things the right way, he hires a DC and then he and the DC find a good Linebackers Coach together. I expect Addazio will move fairly quickly on a new DC. He's going to want someone in place once the quiet period ends so that he can lock in recruits. And then he'll find a Linebacker Coach. In the mean time, best of luck to Brown out in California. -- Diallo is providing solid minutes off the bench and he's avoiding foul trouble. -- BC is blocking plenty of shots. We couldn't exploit length and height earlier in the year. No we are finally playing smart, aggressive D.
-- Winning despite a poor shooting night. We are still missing way too many shots, but the ball movement and rebounding is getting better. More shots will drop soon. The team has one more game before ACC play. A win would be a nice boost before the schedule becomes brutal. One day after news broke that Don Brown was headed to Michigan, BC verbal KJ Gray announced he was reopening his recruitment. Although Brown was involved in recruiting Gray, don't attribute it all to his departure. Most recruiting observers viewed Gray as a soft commitment for weeks. Unfortunately from social media, people can track what these recruits do, follow and say. Gray never really seemed locked in on BC. Taking more visits falls in line with what observers felt. Plus, in media reports Gray even admits he wasn't sure he wanted to play defense at BC and is now considering offense. Aside from his ranking, I don't know much about Gray. If Brown liked him as a DB, then I view it as a loss. But I also think BC needs guys who are buying in regardless of the coordinator or position coach. We are coming off a terrible season. Everyone coming in needs to commit towards turning around. If Gray comes back to BC, I will be happy. But getting too concerned about teenagers who are changing their minds daily, is a waste of time. Recruits flipped on us before Don Brown and will flip after. There will be plenty of names kicked around for Don Brown's replacement. If Addazio's track record means anything, he is likely going to hire either someone he knows or someone from within his network (meaning someone that coached with a Holtz, Davie, Meyer, or Pasqualoni). I don't see an obvious internal candidate to promote. Lempa is closer to retirement than promotion and doesn't have Brown's past success. I don't think Albert has done enough recruiting wise to earn rolling the dice with him as a first-time coordinator. Here are a few guys who will probably be mentioned right away. Chuck Heater -- Heater was Addazio's Defensive Coordinator at Temple. I don't know if there was any bad blood or hurt feelings with Addazio not bringing Heater with him to BC. Since then Heater has done well as Marshall's DC. He's old, but consistent and coached at all levels. He knows Addazio and could probably transition easily. I don't know if he would have the same recruiting success as Brown nor do I know if he would keep the same scheme. Scott Shafer -- Maryland just hired Shafer, so this might seem unlikely, but maybe Addazio can sell him on total autonomy at BC. At Maryland, D.J. Durkin will be the Head Coach and a defensive play caller. In the run up to the season finale, Addazio praised Shafer again and again. Maybe he can pry him away. Kevin Cosgrove -- New Mexico's current Defensive Coordinator. I can see Addazio leaning on a Davie guy. BC can offer a raise. Cosgrove has a long track record but New Mexico's results weren't great this year. Earlier in the week SB Nation posted a breakdown of BC's Defense. It is certainly worth the read, though I feel they put too much emphasis on the front four. While those guys were great, BC was at its best when the DBs were healthy. Don Brown's scheme puts so much pressure on the DBs that once the talent slips a little, the Defense starts giving up big plays. Now while not all those teams were perfect, the only one other than BC with a losing record was Missouri. Usually if you are in the Top 10 of either major category, you will win more than you lose. During the past ten years, no No. 1 Defense has finished with a losing record (other than BC). I keep going back trying to find some sign that a great D one year leads to a great team the next. One team that I found interesting was the 2006 Kansas Jayhawks. They finished a much better 6-6 than BC and only 11th Nationally in Defense (which was strong in the pass happy Big XII), but it was a defense that carried the team. They next year the D remained strong and the Offense finally clicked. The Jayhawks finished 12-1 and won the Orange Bowl. I don't know if BC will bounce back the same way, but that does give me hope. Labels: Boston College Defense, Don Brown, what happened? When will BC ease up the JUCO recruiting? New kicker/punter Satchel Ziffer just graduated from Old Dominion, but that is not his only school. The 5th year senior also spent time at California Junior College -- Pasedena City College. Because he has his degree, his time at a JUCO didn't hold anything up with BC Admissions. Ziffer is at BC to kick and punt, but I hope any success he has leads BC to reconsider its JUCO bias. BC rarely recruits directly from Junior Colleges. Codi Boek and Paul Peterson are the only guys in the last ten years who came directly from a JC. Both were unique circumstances and more than demonstrated they could handle the academic rigor of BC. Neither were typical JUCO guys. But as the "typical" Junior College player changes, BC needs to adjust too. In the old days Junior Colleges were for recruits who weren't recruited or who couldn't qualify academically. Now as more players transfer, more good prospects are using a JUCO season as a pit stop. By playing for a Junior College a player does not have to sit out a year. They can go from a FBS program to Junior College and then back to an FBS program. If a player left his FBS school in academic good standing and just wants more playing time, why wouldn't he fit in at BC? Much like a 5th year, the benefit to BC in recruiting a JUCO is that you sort of know what you are getting. Playing at a Junior College is a much better test than any high school. BC can get immediate depth. For a guy like Addazio who is always worried about senior leadership, an older Junior College player can fill a gap. According to Rivals Database only one Junior College player in the whole country has interest in BC. It's California DE Raveon Hoston. And he doesn't even claim an offer from BC. So don't expect the Junior College situation to change this year. But the increase in transfers can be an opportunity. If BC develops that pool, it can be one more way to build our program without comprising who we are. Hutzler to South Carolina; staff shakeup coming? After a 3-9 season many expected staff changes. But the first change finds BC losing one of its better staffers. On Tuesday, multiple reports announced that Coleman Hutzler is joining his old boss Will Muschamp in South Carolina. Although Hutzler was only at BC one season, his impact on Special Teams was noticeable. BC's coverage units were good and Walker proved to be a big surprise. Hutzler was also one of the younger staffers and more valuable recruiters. The timing of the change was also predictable. The quiet period just started, so no coach can talk to recruits right now. This enables staffers to move without having to explain why they are leaving. Then when the quiet period ends, the Head Coach can recontact recruits and explain away the changes. I expect now that all the BC coaches are back in Boston, Addazio will make a few more staff tweaks. After a strange two weeks, the BC Basketball team needed a game like this. The team cruised against Maine and won comfortably. Maine is not good, but the effort and efficiency was much better. Even Carter shared the ball and made better shot decisions. There were still too many turnovers, but much less confusion and better D.
The team is off for a week and then regroups to play Delaware. Do you want good news or bad news? The good news is that BC added North Carolina athlete John Lamot to the 2016 recruiting class. Lamot was an Elon verbal where he planned to play QB. At BC he will play Defense (probably a linebacker). The bad news is that he is an unrated prospect and another late addition that doesn't seem to have much attention from any other FBS program. As much as I would like BC to land five star prospects that everyone wants, I am okay with the Lamot decision. He's been to BC's camp and the staff has been watching him a long time. They know what they are getting. I also have more confidence in how we use prospects on the defensive side of the ball. If Don Brown believes the guy can play, who am I to doubt? It will be interesting to see how BC fills out the class. We know there will be transfers and a few under the radar types. Hopefully they flip an elite prospect too. Can Addazio find luck in the transfer market again? Without a bowl to prepare for, Addazio and his staff have plenty of time to focus on recruiting. Based on the social media activity, they are locking down their current verbals and looking to see if there are any other players willing to flip to BC. But they are also looking at transfer. 5th year players were key factors in Addazio's first two seasons. Can they save his fourth? BC had transfers last year -- Evan Kelly and Brendan Nosovitch. Unfortunately neither had the impact that a Tyler Murphy or a Matt Patchan had. But Addazio wasn't expecting either to be that big a deal. Both were depth adds. Neither were at critical positions. He didn't bring in a offensive lineman or QB and both positions suffered. At the time the staff had confidence in their youth and didn't see a QB worth the potential disruption to the young QBs' development. Now there are plenty of QBs out there with proven big game experience. The challenge will be getting any of them to come to BC. The sales pitch is a little tougher coming off a 3-9 season than it was the last two years. The confusion on Offense and approach also doesn't make taking a chance on BC that appealing. Plus there are guys on the roster with game experience that a transfer QB will have to compete with. A great player shouldn't be scared of Wade, Flutie, Smith and Fadule, but that is more competition than Murphy faced two years ago. The main selling point remains the opportunity, the success Murphy had and ironically the success of the defense. All Addazio has to say to a QB is "we have a great D. If you help our offense we can be a Top 25 team." BC will probably land a transfer or two. Let's hope that they bring enough to speed up the turnaround. Because I tend to focus on football first and men's basketball second, there are plenty of BC teams I overlook. Both Hockey teams are elite and hardly get talked about here. But the focus of this post is another great team: the BC Women's Basketball. It might be premature to call the team great, but they are off to a great start. They are tearing up their non-conference slate and their only loss came in a Holiday Tournament against Oklahoma. At this current pace, there is no reason to think they won't be ranked by the start of ACC play. But aside from their hot start, BC fans should care about BC Women's Basketball because they recovered from a recent low point. For all of Gene's bad hires, his worst might have been Sylvia Crawley. She left BC with an overall winning record, but the program fell apart under her reign. There wasn't much talent left when Erik Johnson took over. Johnson started to patch things up with recruiting and transfer, but his first three season as the head coach at the Heights were frustrating and full of losing. Now it looks like the team has turned the corner. If they are even close to .500 in ACC play it will be Johnson's best season at BC. The lesson of Johnson though is that we as fans need patience. The lesson for other struggling BC coaches is that they need to recruit, recruit and recruit. Recruiting Women's Basketball prospects to BC is a different sell than other sports, but it is all about effort and passion. Johnson's former BC boss Cathy Inglese also started slow at BC. But once she turned the corner, there was a long stretch of very good basketball. Let's hope Johnson matches that and our other lost programs do too. The Big XII announced a new schedule mandate: all teams must play a non-conference game against a Power 5 team or Notre Dame. It is being referred to as the "Baylor" rule, but plenty of the members have loaded up on cupcakes. The reason for the rule is to help the Conference's power rating with regards to the Playoff Selection Committee. Because current scheduled games are grandfathered into the clause, this doesn't create dozens of openings. But it does create an opportunity for Brad Bates. There are now ten more schools looking for future Power 5 opponents. While BC doesn't offer a big pay day, we do offer a an attractive and seemingly winnable game to the potential opponents. While none of the Big XII schools would be my first choice for a future game, there is enough variety in their membership that Bates is sort of boxed in with his excuses. If he wants a traditional power/and big pay day...there's Texas and Oklahoma. I think BC fans would turn out in big numbers for a game in Austin. And a return visit from either team would surely fill Alumni and create good buzz. Norman might not be an attractive road trip, but come on! Who wouldn't love to see BC play Oklahoma? If Bates just wants to play private school Power 5 teams...there's TCU and Baylor. Scheduling either right now might seem daunting. Both are at their historic peak. But I would welcome either. By the time we get them on the field, it could be very likely both will have reverted to something closer to their historical position in college football. If he wants a matchup with history...there's West Virginia. This matchup predates our Big East membership and goes back to when both teams were Eastern Independents. We've played them 33 times. It is also a relatively close game, so the charter flight costs are a little less. If he wants a winnable game...there's Kansas and Iowa State. Both could get better by the time we play them, but both are traditionally bad. We shouldn't be scared to schedule either. The only real teams that don't fit any of BC's potential profiles for a non-conference game are Kansas State, Oklahoma State and Texas Tech. But all would be much better than playing another cupcake. I doubt BC will add a Big XII team. Bates and Addazio's scheduling moves have been transparent. We can only hope that the ACC starts mandating the type of scheduling the Big XII just embraced. The AFCA voted Don Brown the assistant coach of the year. While this might not be surprising to close BC observers, this is surprising on a national level. Although BC had the No. 1 Defense, we still went winless in conference. National awards usually go to ranked teams. But his fellow coaches clearly appreciate what Brown accomplished. As Addazio makes wholesale changes to the other side of the ball, I hope he uses his experience with Brown as a guide to fixing the Offense. There first two season with Brown at BC were frustrating. We ran his preferred scheme -- aggressive upfront and dependent on great DBs -- with mixed results. We often saw teams comeback as they adjusted to the pressure and burned our DBs late in the game. But as the talent improved -- especially in the secondary -- the system finally started to click. But the whole unit benefited by having one system, one vision, one recruiting mission and one signal caller for three straight years. There are numerous reasons for the Offensive struggles this year, but I think the overriding problem was BC's approach. While still running Addazio's preferred spread/power combo, the Offense and its goals looked different week to week as we shuffled QBs, skill players and the OLine. Now Addazio says we are going to Pro Style. While I think Pro Style will work, Addazio needs to find a coordinator/play caller like Brown. Someone who knows the system well, has run it at other programs and who can plug in players to keep the Offense functional (regardless of injury and age). The one luxury the new Offense won't have is waiting three years for it to click. But the bright side is that the Don Brown Defense will cover a lot of offensive growing pains. After their listless performance against UMass-Lowell, there were multiple reports of BC Basketball players suffering from food poisoning. Now BC's own medical staff is calling the sickness E.coli and blaming the Cleveland Circle Chipotle as the source of the outbreak. A medical alert was sent to the entire student population. In fairness to the burrito chain, they are saying there have been no official cases of E.coli in Massachusetts. The State also confirmed that the issues facing the students had yet to be officially classified as E.coli. Chipotle has temporarily closed the Cleveland Circle location for inspection and cleaning. With ten players suffering from some form of gastrointestinal illness and Eli Carter's ankle still healing, Wednesday's game against Providence seems that much more daunting. It is that time of year, where Asgard offers a Eagle in Atlanta reader discount on their products. Asgard has a bunch of classic sports and classic comic posters that make for great Christmas presents. There is also the BC Poster Calendar. It is a wall calendar featuring old football programs. Each month is detachable so that is also can serve as a poster. It makes for a great gift for those BC fans in your life. I've always received good feedback on people's purchases. 1. Go to www.asgardpress.com, and use the promo code "atleagle15." I do get a referral on all the purchases made through the link. Remember that idiot BC blogger (from Atlanta) who thought this basketball team would have a good non-conference run? Once again, I couldn't have been more wrong. On Sunday, BC lost to UMass-Lowell. Although key players were injured or missing due to various ailments, there is no reason to lose to UMass-Lowell. They are young. They are small. They are a bad team from a low-major conference. They've only been playing at this level for a few years. This was a terrible loss for BC. It makes me question everything and hopefully is making Christian question everything. The biggest problem remains the defense on the perimeter. Christian showed that he could coach D last season. Where is that this year? The guys are young, but they are making the same mistakes over and over. If you're looking for silver linings, Reyes played well in extended minutes and the Hicks also made the most of his shots. Congrats to former BC assistant Pat Duquette on the victory. As for BC, I have no idea where we go from here. This team is not great, but they are more talented than this. Christian needs to wake them up and coach them up soon. BC lost its Elite Eight game against Syracuse Saturday 1-0. The game was scoreless until the Orange broke through in the 79th minute. It marks the end of the season for BC, which saw the team finish third in the ACC Atlantic prior to this NCAA run. Soccer is one of the consistently strong programs at BC and is under appreciated (by this blog) and most of the BC community. Congrats to the team on the season. Please support BC Hockey annual Christmas Toy Drive. Between now and December 10, there will be toy collections (new and unwrapped) at all BC home games. Last year seemed like Brad Bates' chance to return to his Alma mater Michigan. But the Wolverines decided to keep their interim AD around for another year and postpone a full search. Now they are back in the AD market and Bates is on everyone's short list (via BCI). This is all very preliminary, so there isn't much to get too worked up about. Bates seems like a good fit, but who knows what Michigan is looking for this time around. Bates' BC goals are not close to being met, but he's left his stamp on the school with the Addazio and Christian hire. Because of the challenges that both programs faced recently, there are plenty of BC fans willing to help Bate pack for Ann Arbor. I don't dislike Bates, but also think now is probably the best time for him to go. His replacement would have plenty of time to evaluate the coaches, but not be under immediate pressure to make a change (like Bates was with Spaz). Plus the new AD could come in and lead the final public stages of the "master plan" and indoor practice facility. Bates has done most of the work already, so the projects wouldn't be as daunting for his replacement. Given that AD hires aren't on the same sort of timelines as coaches, this might take a while. We will update our opinions on Bates as the story unfolds. -- Garner went crazy for Penn State and really killed BC's momentum. It was a fluky though. He made long ones. He made them with guys in his face. That happens some times and I am not worried. -- Dennis Clifford put in good minutes and made his shots. It was much better than how he played in California. Diallo looked better too. -- The offense doesn't still seems really impatient and without purpose. How much of that is guys not playing together long or guys just not knowing where to go with the ball? It is still too early for Christian to explode on these guys, but he does need to do something. There is enough talent to win these games. They are just not playing two competitive halves. Per FBschedules.com, BC added Ohio to the 2020 schedule. By itself that is not a bad game or a big deal. However, in the context of all our future scheduling, it is terrible. Bates and Addazio keep shrugging and explaining that they are penned in by past commitments and conference switches and that is why our non-conference schedule disappoints. They will also say that it takes years to schedule another Power 5 team. There are elements of truth to all of that. But it also covers up their desire to keep the schedule soft. If they really wanted to add some challenges to the future, they would be doing it now. Instead they are locking in winnable games. Bates is also misreading the college landscape and his own fanbase. I do agree that winning easy games is probably a better perception decision than losing hard ones. Recruits, the media and most fans look at W-L first and not who you played. However, by 2020 Addazio should be beyond padding the win total. If he still needs those Ws in his 8th year, then something is wrong. At that point he should be established enough that BC can take a risk. If he's not, then there will be pressure to fire him whether we are beating Ohio or losing to Alabama.